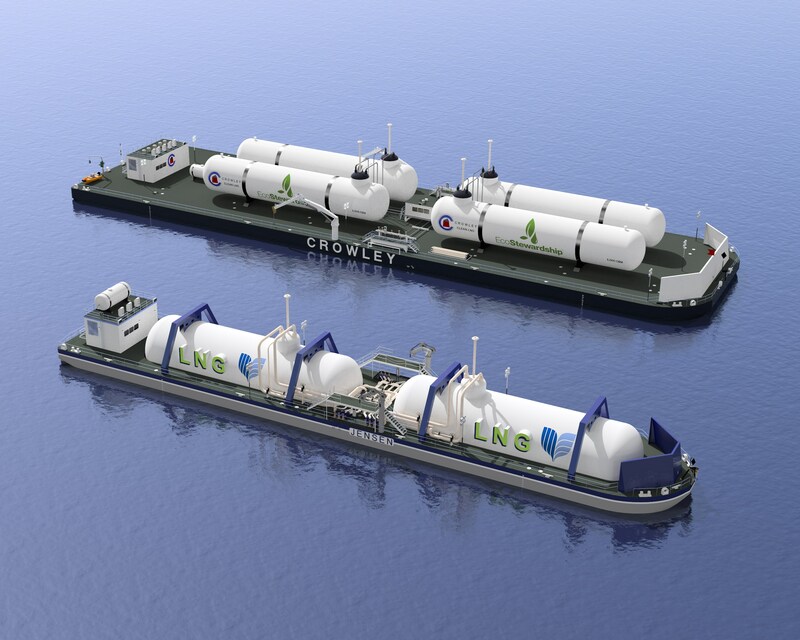 (August 19, 2015; SEATTLE) – Crowley Maritime Corp. subsidiary Jensen Maritime today announced the development of two new, liquefied natural gas (LNG) bunker barge concepts that can be fully customized to meet a customer’s unique needs. The first concept involves outfitting an existing barge with an above-deck LNG tank. The concept can be further modified to accommodate more than one type of product, if a customer has a need for multiple liquid transfers. Advantages of this design include a fast turnaround and a reduced need to invest in specialized assets if a customer has short-term LNG requirements. The second concept is for a purpose-built, new bunker barge. Offering greater carrying capacity and improved visibility, the design features a larger LNG tank that is nestled inside of the barge. This new barge will also feature the latest safety features and efficiencies. In addition to offering customers maximum flexibility and top safety features, all Jensen designs are developed using the company’s proprietary production engineering capabilities, which makes the outfitting, construction and assembly more efficient. Bunker barges offer an innovative solution for the maritime industry, which is currently struggling with the decision over which to develop first – LNG infrastructure or vessels. These barges are an ideal resource for those who have LNG needs at ports not located near an LNG terminal or as an alternative to over-the-road transportation.